Sales management and organization is known as a discipline used in business organizations which focuses on practically applying effective techniques in selling while also managing all the sales operations of the organization. Properly managing and organizing sales is essential for the success of any business because it significantly increases the amount of their net sales, thereby driving more profits. If you are planning to take up a sales management and organization certification course, then you can expect to become an expert in managing sales and this will allow you to take the roles and responsibilities of a sales manager. As a sales management and organization expert, you are usually tasked to perform a lot of essential functions that need skills in sales planning, leadership, talent development, human resources and resource control including organizational assets. You have to be serious in honing your skills in these areas so you will become successful in the sales management and organization field. Sales management and organization is also defined by experts as a process which involves the formulation of effective sales strategies by developing sales force compensation and account management policies, sales plan and sales revenue forecasts. It also involves implementing sales strategies by training, motivating, selecting and supporting sales force and revenue targets. Experts also define sales management and organization as an act of developing and implementing methods for monitoring, evaluation and sales performance and effectively analyzing the behavioral costs and patterns linked to these. If you want to generate expert knowledge about sales management, then the sales management and organization certification program is right for you. Becoming a sales management and organization expert is never impossible with the existence of sales management and organization certification program from Brainmeasures. Brainmeasures is proven to be legitimate because it has already received its ISO certification and continues to run with the help of the standards set by ISO. All the existing programs in this legitimate online certification company have been developed by experts and this assures anyone who decides to take up a sales organization course or any other certification course from Brainmeasures about the comprehensiveness and the authenticity of its training and learning resources. 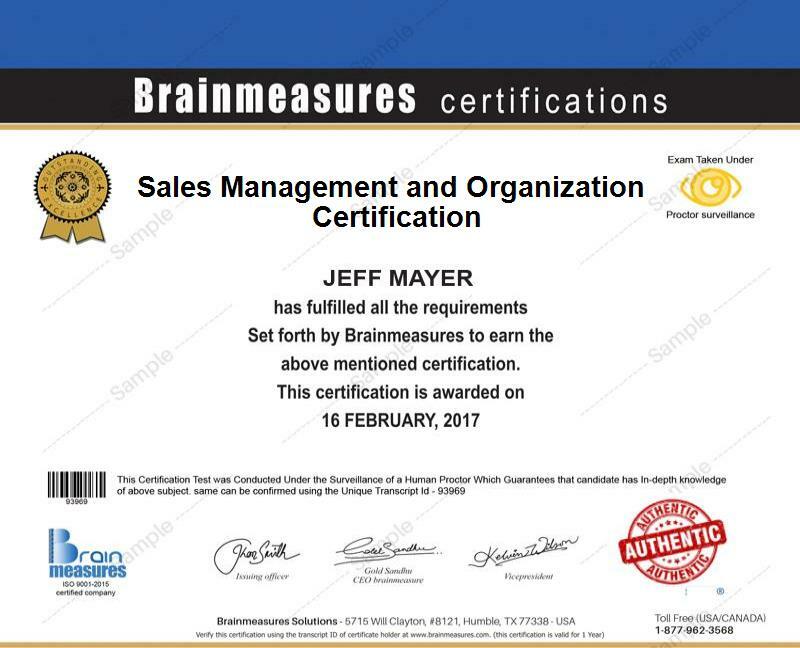 Aside from allowing you to take a hold of your certificate, the sales management and organization certification program from Brainmeasures is also a major help in your attempt to learn everything about sales management and organization and the keys towards allowing an organization to achieve success by dramatically increasing its sales. Since Brainmeasures allows anyone to be part of the sales management and organization certification program as long as they are interested because it does not come with any qualification or requirement, you can enroll in the program anytime. But keep in mind that you will gain more benefits from taking part in this program if you are a business owner who wishes to monitor your sales all the time, an aspiring sales manager or an aspiring sales professional who wants to know everything about how to effectively manage sales transactions while ensuring that an organization receives the highest level of sales through your efforts. Getting a higher salary is possible after you become one of the few sales management and organization certification holders. You can expect to enjoy an annual salary of $42,000 to $117,000 after becoming certified in the field.